The NSW Government is delivering the largest litter reduction scheme ever introduced in NSW. Return and Earn will help reduce the 160 million drink containers littered in our environment each year. Drink containers make up almost half of the volume of litter in NSW. Return and Earn is part of the NSW Governments commitment to reducing litter volume in NSW by 40 per cent by 2020. Consumers can exchange an eligible container at an approved collection point to receive a 10 cent refund per container. Containers should be empty, uncrushed, unbroken and with the original label attached. As of June 2018 there will be a winter trial return and earn reverse vending machine (RVM) at Bondi Beach. The RVM is located behind the Bondi Pavilion in the carpark adjacent to Campbell Parade at Beach Road. The RVM will be in operation from 8.00am – 6.00pm, 7 days a week. Please note that the RVM will closed during the Sun-Herald City2Surf event on 12/08/2018. The RVM is for general public use only; it is not for commercial business use. Help us keep Bondi beautiful. Please use rubbish and recycling bins next to the Return and Earn RVM to dispose of any rubbish, packaging or ineligible containers not accepted by the RVM. Eligible containers include most glass, cans, plastic and paperboard drink containers between 150 millilitres and three litres - those most often found in the litter stream. The main beneficiaries of the scheme are the environment and the community. What containers can be refunded? 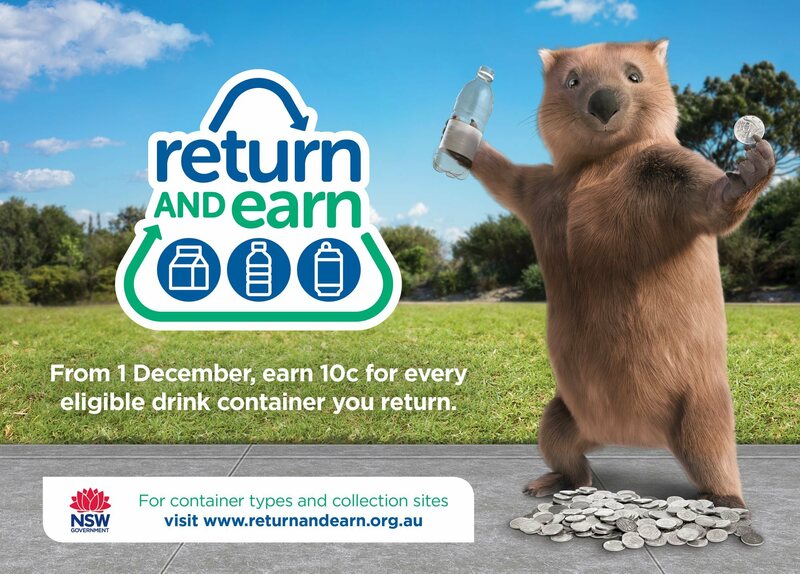 Most empty 150 millilitre to three litre beverage containers will be eligible for a 10 cent refund when presented to an approved NSW collection point. Containers should be empty, uncrushed, unbroken and with the original label attached. However, not all containers are included in the scheme. See below list for containers that are accepted and those that are not. Should I continue to use my yellow-lid recycling bin? Yes, please continue to use your home yellow lidded recycling bin for all recyclables, including those eligible for a refund, if you are unable to taken them directly to a drop off point.